"There is a tradition dating back to when the folk hero Doji Yasurugi presented Kunshu to the first Hantei. 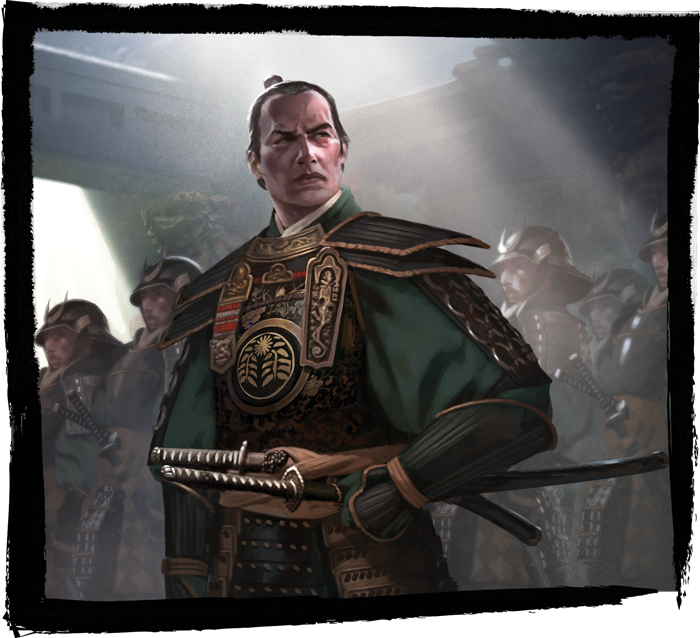 Before the Emperor’s coronation, the Seppun entrusts Kunshu into the care of a Great Clan, who guards the sword until the day of the Emperor’s ascension. They have the honor of presenting it to the newly crowned Son of Heaven." –Robert Denton III, "Imperial Gifts"
The Emerald Empire is a land rich with traditions. Along with the teachings of Bushidō, these traditions help to shape a samurai's mind and spirit. Traditions help to define the Great Clans and the families who comprise them. Traditions bind the present to the ways of the past, and these traditions add meaning to the lives of the Empire's citizens, imbuing their days with form and purpose. Likewise, Legend of the Five Rings: The Card Game is rich with traditions. These traditions touch upon everything from the tensions and allegiances between the Great Clans to the costumes samurai wear to large gatherings. Chief among the game's traditions, however, are the honorable duels fought between skilled samurai at various tournaments. As a result of this desire—as expressed by you, the members of the Legend of the Five Rings: The Card Game community—we are returning our Kotei to a form that more closely follows tradition. This applies immediately to all the Kotei and Grand Kotei of the Kunshu Season and to all such events going forward. All Kotei will now feature a top cut. As a result, the six rounds of Day 1 Swiss will be followed by a Day 2 cut available to all players with 43 or more points. Day 2 play will begin with single elimination rounds and run until only a single samurai remains standing. Hatamoto status will once again be granted to the top samurai from each of the seven Great Clans—as well as both players in the Top 2 in the event that they both hail from the same clan. This Hatamoto status is granted only at the end of the event and does not apply retroactively, meaning that only players who enter the event as Hatamotos are able to win Favor points, although the newly honored Hatamotos will be eligible to earn Favor points for their clans in future events. Existing Hatamotos will earn Favor points and Glory points during Day 2, the same as they would have at a Grand Kotei (with an additional point for each single elimination round they reach from the Top 16 forward). Additionally, each Kotei event will now feature an Elemental Challenge to run alongside the Day 2 single elimination rounds. 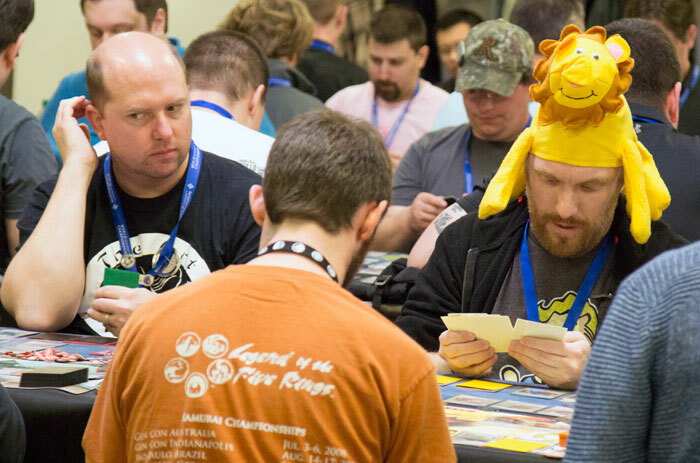 Participants in these Elemental Challenges will be able to play for the custom cards, tokens, lanyard, and playmat associated with the events, as well as for the free first-round bye the winner gains at a future Elemental Championship (Regional). Finally, players will find Skirmish Pods and Enlightenment Pods running as side events throughout the Kotei, and players eliminated from the Day 2 single elimination rounds will be able to play for valuable koku in these side events. Note: We will retroactively award Hatamoto status to the top samurai from each of the seven Great Clans at the Kotei in Philadelphia and Madrid. Also, because the decision to reinstate the Day 2 cut to the Kotei series means there will be no more Sunday Kotei tournaments, players who registered for Sunday events will be contacted by the event organizers and informed about their new options. The Grand Kotei are changing less than the Kotei. This is largely due to the fact that they were already two-day tournaments and will continue to remain so. As with the Kotei, the Grand Kotei will see all participants with at least 43 points advance to the single elimination rounds of Day 2. 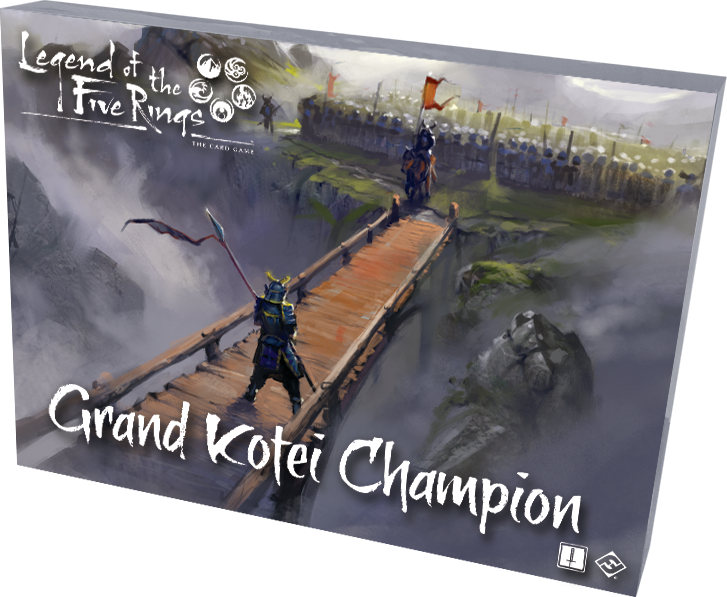 One important change is that—as with the Kotei—the Grand Kotei will now award Hatamoto status to the top player from each of the seven Great Clans, as well as both players at the final table. Those participants who fail to qualify for the Day 2 single elimination rounds—or are eliminated prior to the Top 8—may still charge into a Proving Grounds tournament and place themselves in contention for an acrylic Kunshu Season bid dial and an invite to the Winter Court World Championships. Alternatively, these players may take part in any of the Skirmish Pods and Enlightenment Pods running as side events throughout the weekend. Because they have their own prizes, Elemental Challenges do not award koku. At the same time, the prizes awarded in the Elemental Challenges will not appear in the Kunshu Season Kotei Series prize wall. The fact that we are reinstating the award of Hatamoto title to the top player from each clan at each Kotei and Grand Kotei means that we are likely to see more Hatamoto titles awarded over the course of the Kunshu Season Kotei Series. 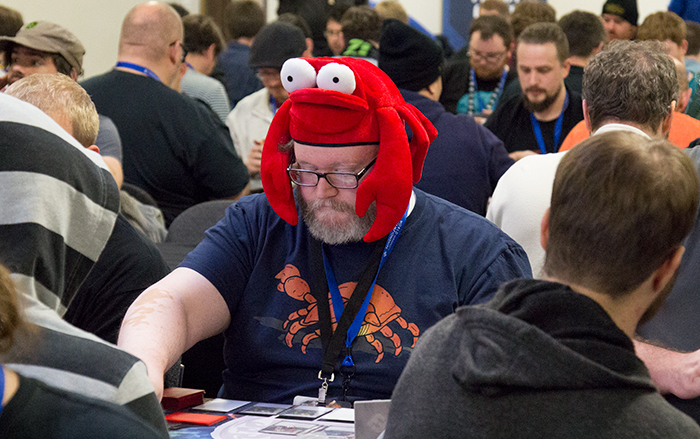 We look forward to seeing more of you claim your reserved seats at the 2019 Winter Court World Championship! Apart from the increased number of titles awarded, Hatamotos will find the Hatamoto reward structure unchanged. You'll still claim a Hatamoto pin when you earn Hatamoto status. Your opponents will still claim a triumph pin if they defeat you. And you'll still claim a ceremonial triumph pin each time you attend a Kotei event as a Hatamoto. Finally, Hatamotos will continue to represent their clans in their bids for the Imperial favor, and we will continue to track the Favor points awarded to each Hatamoto throughout the Kunshu season, awarding free flight and lodging to the 2019 Winter Court World Championship to the top Hatamoto from each Great Clan who has not already won free flight and lodging by winning a Grand Kotei. These changes to the Kunshu Season Kotei Series reestablish some of the long-ingrained traditions of Legend of the Five Rings: The Card Game and its Organized Play. Accordingly, we hope they will restore harmony and that they will help us carry the game forward with meaning, intent, and all the ritual and honor accorded to the greatest of traditions. Celebrate these traditions with us. Celebrate the essence of Rokugan. Visit our list of Kunshu Season Kotei Series events, and make your plans to participate!